Gray, Green, Black Bins… What goes where? 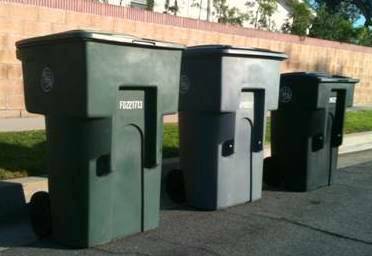 The City of Torrance curbside collection program makes residential trash and recycling easy. The program consists of one Black, Gray, and Green bin. What do the colors represent? The Gray bin is for recycling of plastics, glass, and paper. Items such as aluminum cans and foil, plastic bottles and containers, cardboard, empty food boxes, egg cartons (cardboard only), glass bottles and jars, junk mail, magazines and brochures, metal coat hangers, newspapers, phonebooks, and tin cans. Do not place liquids, napkins, tissue paper and anything soiled with food into Gray bin. Tip: Please rinse out containers, but be sure all liquids are drained from containers before placing in recycling bins. Tip: Labels can be left on the containers. Lids can be recycled in the bin, but please take them off the containers. The Green bin is for recycling yard waste including grass, leaves, wood chips, tree branches, sawdust, garden trimmings, green plants, and weeds. Material cannot protrude from the top of the containers more than 2 or 3 feet. Tip: Recycle your Christmas trees any time in your green waste container. Cut up your Christmas tree to meet green waste collection requirements. Tip: Leave your grass clippings on the lawn – it’s a good source of nitrogen and acts as a fertilizer. You can also recycle your green waste and food waste at home to create your own compost. Go to www.smartgardening.com to learn more. The Black bin is for trash only. Trash items include food waste, soiled toiletries/food containers, cigarette butts, diapers, sponges, styrofoam, waxed paper, palm fronds, cactus, ice plant, and yucca. Do not place dirt, rock, sod, concrete, construction debris, hot ashes, liquids, electronics, and hazardous wastes into Black bin. Tip: If you need additional capacity, leave the lid open and place a securely closed additional 30-gallon trash bag on top of your other waste. 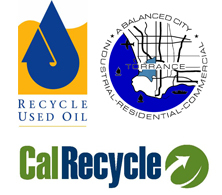 Visit the City of Torrance’s Residential Curbside Collection webpage for more information.